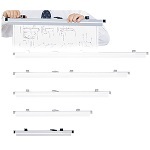 Safco Products Company manufacturers products that help get you organized with ease. Safco expertly engineers for quality with all of their office products. The Safco Products brand includes; Office Furniture, Safco Blueprint Storage Products for Engineering Related Documents, Safco Office Chairs, Steel Flat Files, Safco Drawing Clamps, Safco Blueprint Racks, Safco Blueprint Stands, Safco Drafting Tables, Drafting Chairs and Stools, Safco Drawing Storage Containers, Handtrucks, Safco Drafting Stools, and Ergonomically Designed Office Furniture. Safco manufacturers a very nice selection of quality office and industrial products mostly designed for comfort, production, and organization in the work place. EngineerSupply is a Full-Line Factory Authorized Safco Products Dealer. If you can't find what you're looking for, please contact us. Shop our site for a huge selection of Safco Office Products, Furniture, Office Chairs, Desks, Office Organization Products, Safco Storage Products, Safco Drawing Clamps, Blueprint Racks and Stands, Storage Bins, Utility Carts, Safety Mats, Handtrucks, Shelving Systems,Commercial Waste Receptacles, and a whole lot more. We recently introduced the Safco Focal Line of Ergonomic Office Products such as Standing Desks, Comfortable Stools and Seating, along with innovative furniture for comfort and ergonomics. The Safco Products Company has a solid reputation in the Office and Furniture Products Industry and has many products and solutions to choose from. EngineerSupply is a full-line Safco Office Products Dealer.